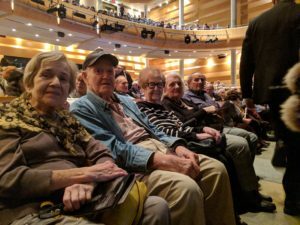 Last month, V!VA Thornhill Woods Retirement Community partnered with Beit Rayim synagogue and the City of Richmond Hill to bring our Community Members to a program called “Gedenk: Remember Yiddish Ghetto Music” at the Centre for the Performing Arts. We received the VIP treatment and schmoozed with City Councillors and Members of Parliament, before enjoying the emotional, musical, and educational show put by the Montreal Yiddish Theatre group. It was truly a unique experience and we all look forward to next year’s program.